August.2003. Sadie Fagan's class photograph. Aug.2003, email, John Caldwell, Australia. 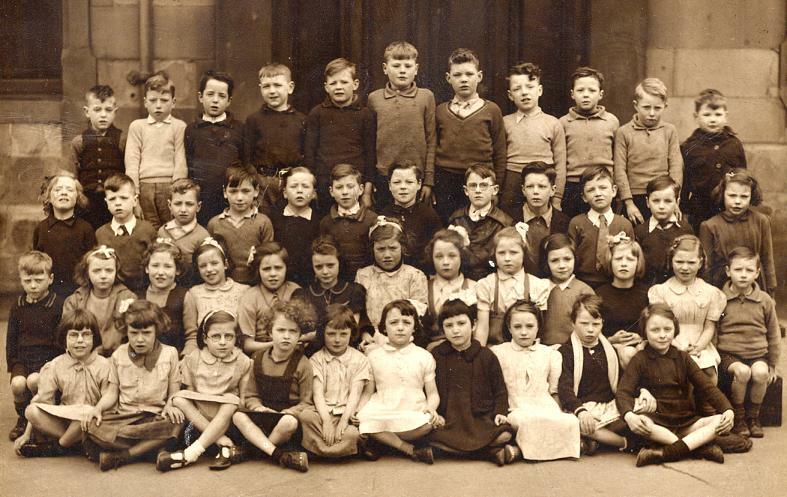 ".......Here is a Rumford st School photo given to me by Sadie Fagan who now lives in Australia she was on a visit from Adelaide to here in the west visiting her cousin Wullie Watson from Savoy st who is also in the photo. They say photo was taken between 1944 & 1945 the ages could be 8 or 9 year olds ?. all the names listed are from Sadies memory. The names are from the left. Back row #2 James Scott #4 A Millar #5 A Dunlop #8 J McMillan #10 W McKenzie #11 J Bell. Third row #1 A Agnew #3 J McCloud #5 T Boyce #6 W (Wullie) Watson #8 J Russell #9 T Wilson #10 J Alexander #11 M Ashford. Second row #2 V McArthur #3 L Cruth #5 A McDougall #6 H Hudson #7 A Donelly #8 M Russell #9 M McDougall #11 H Grant. Front row #2 N Dempster #3 Sadie Fagan #4 J McPherson #7 C Archibald #9 I Cooke #10 M Muir. Hope this meets with your approval Wull. Jun 2004, Margaret Dunlop, Alberta, Canada. "...Hi Will, I have a name for you on the Rumford Street 1944/45 school photo. 2nd row #1 is Robert McAulay. (My Uncle) Thanks for all your time and effort on this website." ....just wanted to let you know that my Granny is one of the unidentified people in the Rumsford Street School photograph 1944/1945 8-9 year olds. Her name (then) was Margaret McAleese and she is standing in the second row, number 4. Her and the family got a real kick out of seeing her as a child, thank you! I am in the photo of Rumford street school 1944 . I am in the second,row ,I am put as H Hudson but my name is June. I am trying to contact any one in the class that may know me. I did have a friend called Nessie. I hope you can help me.